In the latest issue of MCN, out August 28, there’s a FREE 16-page guide to sorting your bike’s suspension. There’s barely a rider on the planet who couldn’t benefit from a custom fit set-up. What suits a 10-stone test rider on a smooth circuit won’t be ideal for a 15-stone owner on o bumpy British backroad. In the first week of this special feature we look at sorting the: Aprilia RSV-R, Ducati 998 and ST4, Honda SP-2, Blackbird, CBR600F-S, Kawasaki ZX-6R, Suzuki GSX-R600, Triumph T9551, Sprint ST and TT600 and the Yamaha R6 and FJR1300. 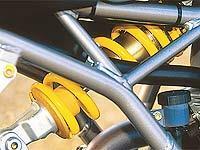 The guide will help you to understand suspension terms and adjustments and help you understand what your bike is telling you every time you brake, corner and accelerate. *World exclusive pictures of the new Kawasaki ZX-6 and Z1000. All the pictures and all the details of two of next year’s most important bikes in a stunning four-page special. *News on the prospect of a chat and drive ban on mobile-wielding motorists. *New Numero Tre Tiger points at possible new, sharper Triumph trailie. *Kawasaki’s new VN1600 breaks new ground in the giant cruiser war. *Norton’s back….in America at least. Read how the 235bhp V8 Nemesis project will rear its head again. *Honda’s FireBlade gets the long-term treatment from Macr Potter. *We road test Ducati’s range of Monster road bikes. *Rossi’s tyre nightmare at Brno. *Why Hizzy’s got the bit between his teeth and how he’s discovered a new will to win. *John Reynolds dismisses the rumours around his Suzuki ride. *Explosive pictures from the German Supersport series. *Ben and Eric Bostrom are involved in a serious accident on holiday. PLUS there’s your letters, seven days of things to see and do around the UK and abroad and your FREE copy of MCN Bike Mart – the place to buy or sell your bike. Don’t miss it.